We are moving our recent exhibition (together with some new work) up to Milton Keynes. 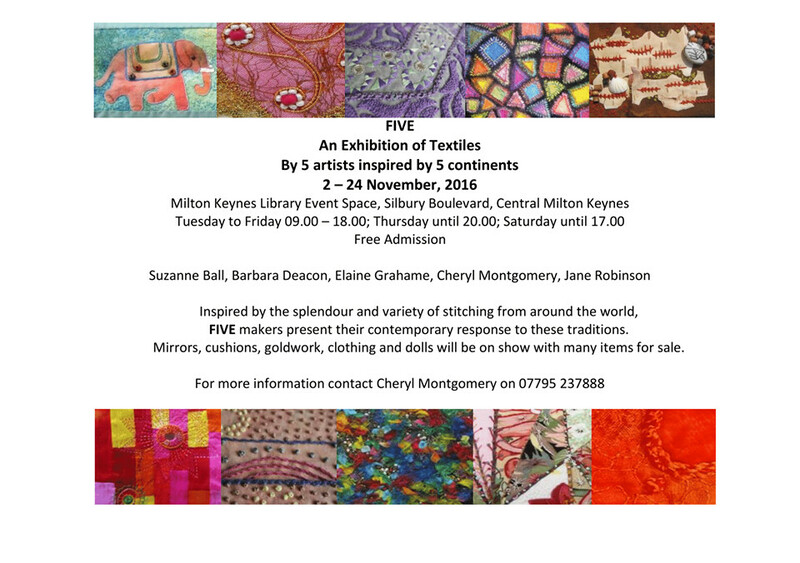 We are showing stitched textile work inspired by the wonders of World Textiles. You will get get two exhibitions in one visit, because we are exhibiting alongside an Embroiderers Guild exhibition based on the work of garden designer Capability Brown. I’m working away on some new pieces for the new location. Will try to post some images but time is escaping – as it does – I think the world has sprung a leak somewhere, so the time dribbles out! I hope you can come and visit us at the new venue. This entry was posted in News and tagged Barbara Deacon, Capability Brown, Cheryl Montgomery, Elaine Grahame, Embroidery, Exhibition, Five, Jane Robinson, Milton Keyens, Stitched Textiles, Suzanne Ball, textile art, Worthing on October 22, 2016 by Jane.